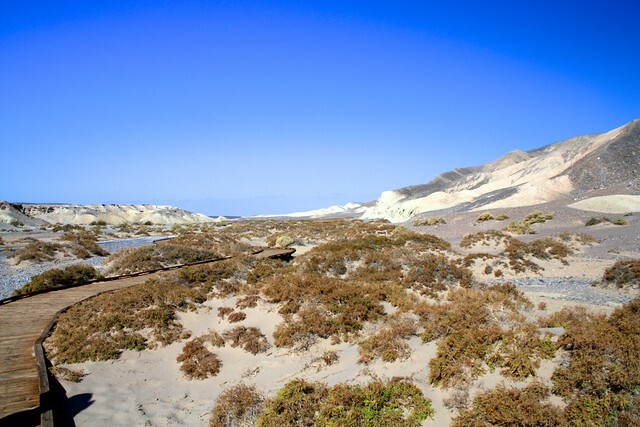 A short half-mile loop on a boardwalk through a very, very strange area of Death Valley – a bonafide salt marsh in the middle of one of the driest places on earth. If someone told you that you could drive out to the middle of Death Valley and see fish swimming in a flowing creek, you’d probably think they spent too much time in the sun. But if you traveled to the Salt Creek Trailhead, you could see them for yourself. During the last Ice Age, Death Valley was covered by an enormous inland freshwater sea called Lake Manly. As the ice receded and the landscape sank, the water dried up – but little pockets of life clung on. At one time, the pupfish swam throughout the entire water basin – but since the climate became more arid they found themselves stuck in various springs and water holes scattered in the desert, and the original species has evolved into ten distinct subspecies. 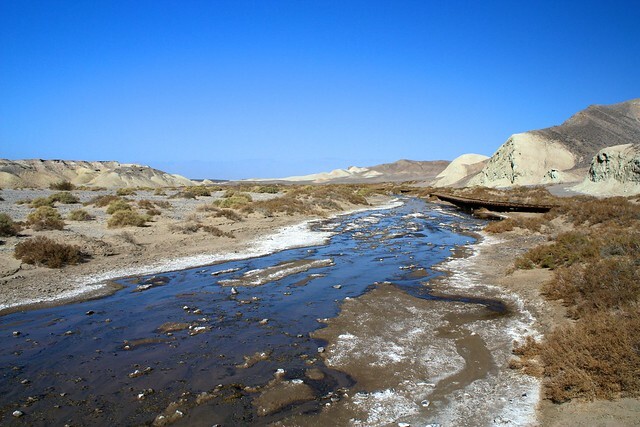 The Death Valley Pupfish or Salt Creek Pupfish lives only in the briny water of Salt Creek, and if you’re patient and keen-eyed you’ll probably be able to spot them in the creek on this hike. The hike itself is a very short walk along a boardwalk-trail through the salt-marsh like terrain. Note that this is best hiked after California has had some of its winter rains — and that the pupfish are usually most active in the early / mid Spring. By late Spring and early Summer, much of the water here will have dried up. 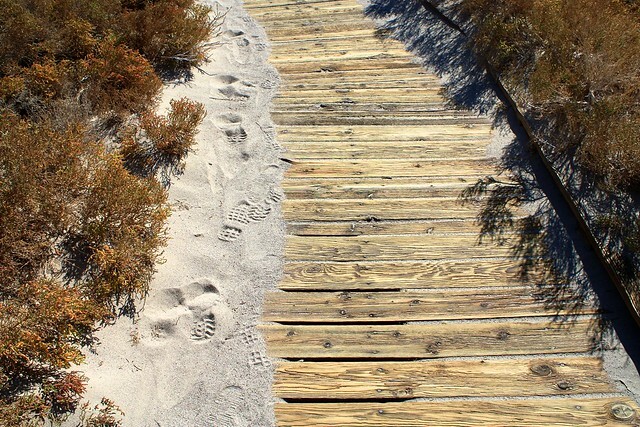 If you’ve ever been along a coastal dune boardwalk before, this feels eerily similar – this reminded me a lot of little walks along Cape Cod … except, you know, you’re in the middle of the desert. The whole experience is strange – these things are not supposed to be together! Early on in the trail, the boardwalk skirts the side of Salt Creek. Depending on the time of year, this will either be a surprisingly flowing stream or a dry wash. If you look closely, you may see some pupfish darting through the water here, but if not don’t worry – there are usually plenty more further upstream. Continue as the boardwalk makes its way through the dense growth of pickleweed and salt grass – two plants that have adapted well to this very harsh and unique environment. Eventually, the boardwalk splits and ends at a loop – it doesn’t matter which way you go first. Both routes will take you to the spring-fed pools of upper Salt Creek, the only section of this marsh that has water year-round. 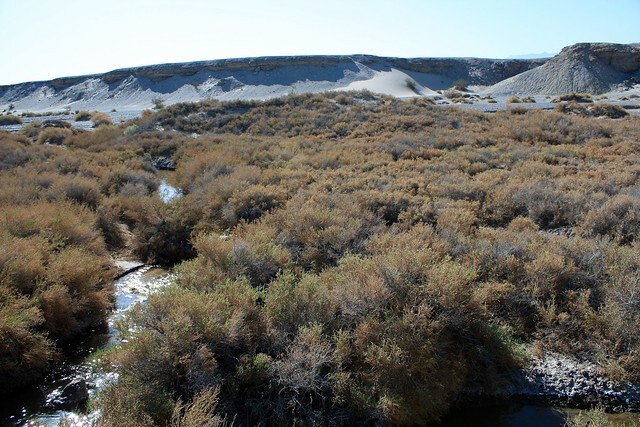 If you gaze into the water here, especially during the late winter / early spring, you’re likely to see a ton of tiny pupfish on the creekbed, and a few swimming in the water. 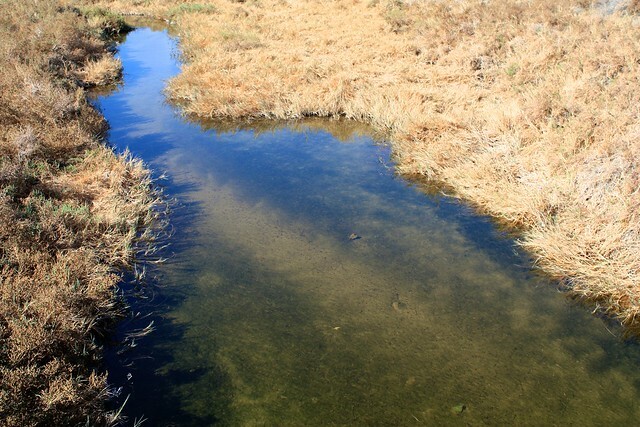 This impossibly tiny chain of pools is the only place where pupfish eggs can survive into the next season. Excellent - you're on a boardwalk the whole time, so if you get lost on this one you probably shouldn't ever be hiking alone. There are many developed and primitive camping options in Death Valley. From Stovepipe Wells Village, head 12.5 miles west on CA-190. From Furnace Creek, head north about 12.4 miles on CA-190. The signed turnoff is on the west side of the road. Drive down a dirt road for a mile (passenger cars OK) and park at the trailhead. I am surprised to see water, let alone fish in Death Valley. When I was there, it was so hot, I couldn't imagine water being there. But from your directions it sounds as though this area is in the higher parts of the park? I do remember driving far from Stovepipe Wells Village to see the Kilns (look like bee hives), where they used to make charcoal years ago. It is at a much higher elevation and is nice and cool, to the point where I began to feel a little chill. One day I hope to go back there and do a hike in the higher elevations.